Today is a sad day for me, for Zambians and for all the people of the world. 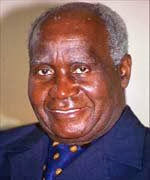 We have lost one of the greatest sons of Africa, and the world is poorer for it. When Mandela left South Africa for the first time after 27 years of incarceration, I was delighted and honoured that his first destination outside of South Africa was to Zambia. It is was a privilege to welcome home a brother I had last seen free in 1962 on his last trip outside of South Africa. At our subsequent meeting in Ethiopia, he and OR Tambo had come to brief us on the ANC’s plans to escalate the struggle for independence, where OR was to lead the struggle from the international front, while Mandela was to lead the domestic struggle. When I saw him again on this joyous occasion in 1991 I told him that the people of Africa were waiting for him to take up the last mile of the struggle for Africa.